Squirrel!, originally uploaded by plingthepenguin. While his nibs has been kept confined to barracks (so we can keep an eye on his eye) it seems the local wildlife is getting complacent! 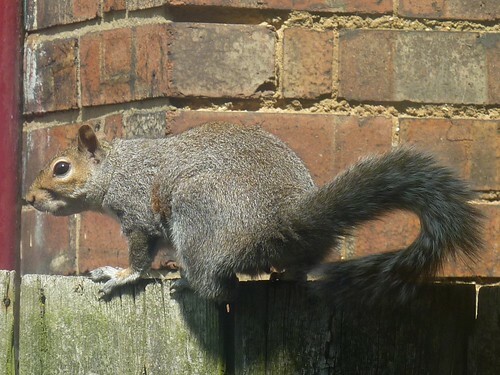 I don't think I've ever seen a squirrel in the garden before, but I just looked round while I was washing the dishes and there he was, running along the fence. By the time I got the camera he was sitting on the gate - first next door's, then ours (which is when I took the pic through the kitchen window) - examining the gardens and deciding on his next move. Whatever he was looking for, he didn't see it here, and ran back down the fence between the gardens and off to other places. Current Music: LCD Soundsystem "This Is Happening"
That's a great picture. I hadn't realised that the "grey" ones could have brownish faces! I wonder what the critter was looking for? Maybe he wanted to have a chase round the garden from a ginger furball, but there was none to be found?